How did these four drivers get here? 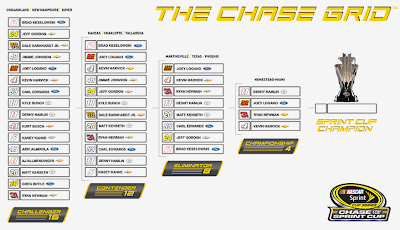 In the case of Logano, who is the youngest driver by far of the four, he sailed through the Challenger and the Contender rounds by winning in each round. He has been a winner all year with five wins, more than the other drivers have won, and he has excelled at the intermediate, mile-and-a-half tracks, which this Sunday's race is. For Harvick, he more or less faced a win-or-go-home race Sunday but fortunately it was at perhaps his best track as he would dominate the race to survive and advance. Harvick also has won a ton this year, four times to be exact, and he has the reputation, and deservedly so, of being a bit of a closer as he puts himself in the right position to win. In the case of Hamlin, who only has one win this year, he has been very consistent and was consistent in all three rounds to advance. And he has the strongest record of success at Homestead as he has won at this track twice, plus is the defending winner of this race. The case of Newman being here is remarkable, and almost incomprehensible. Newman has no wins and only four top fives and 14 top tens. But he has kept himself out of trouble with only one DNF and he has been very consistent in this Chase. He also had to punt Kyle Larson to advance from Phoenix to the championship race and I have no problem with that considering literally every other driver would do the same thing. If he were to win, he may have the distinction of having the worst season ever for a champion and the fact that he would have no wins would directly run counter to the purpose of the new points system. Well I have to pick a winner of the 2014 Chase for the Sprint Cup and if there is one driver that I had confidence in to get a win to win it all, that driver would be Kevin Harvick. I think he has shown the speed to run up front all season long and he knows how to win. He may not have a win at Homestead but he runs very well there and this Sunday, I think he will come out on top as he will get the win and get the championship.